Kia de LaSalle is a member dealer of the large family of Groupe Couture, one of the best automobile groups in all of Quebec. The team always want to make sure to meet all your needs and to surpass the client’s expectations. And we love to overcome challenges so we offer you this personal invitation to come and see us so that we can prove our commitment to excellence to you. 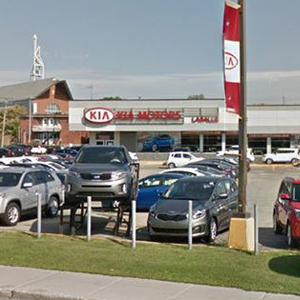 Serving the South Shore and Greater Montreal, Kia de LaSalle is a top-notch dealership who offers a vast collection of Kia automobiles. The reason for our success is simple; we are careful to beat all the competitor’s prices. Here we make no compromises on quality, and we make sure to sell only the very best on the market. Our sales staff, made up of well-known Kia Canada professionals who have more than 10 years experience, are devoted and thoughtful. Always ready to listen to your requests and totally honest, one of our advisors will ensure that you have the best buying experience of your life. What’s more, our experienced mechanics who work in your Kia service department and in our parts department will complete their jobs thoroughly and quickly. At Kia de LaSalle, we know that finding a new vehicle can be hard work, and that’s why we put all our online resources at your disposal. You can look through our online showroom and discover the features of our new or used Kia from the comfort of your living room! If you need our Kia financing to buy your new car, just fill out an online credit application form. To find out more about our new Kia promotions or to plan a free test-drive, contact us today. Don’t wait any longer to come and meet our Kia team from Groupe Couture; you’ll see, you will love your time at our dealership!